Investigative journalism in its true sense plays a key role in maintaining accountability and transparency on issues affecting people in general. The recent studies conducted by International Institute of War and Peace Reporting (IWPR, 2017), International Research Exchange Board (IREX, 2017,) International Media Support (IMS, 2017) and Free Media Movement (FMM) observed that investigative journalism in Sri Lanka is growing slowly while facing a systemic challenge, as a result of weak media pluralism, lack of editorial independence, political and commercial orientation of media ownership, insecurity, impunity and a lack of enabling policy environment etc. Adding a different dimension, the Investigative Video Storytelling program – #IVS, initiated by Sri Lanka Development Journalist Forum (SDJF) in partnership with IWPR and Postgraduate Institute of Agriculture, University of Peradeniya, intents to capacitate 25 young mid-career journalists who are interested in using videos as a potential tool to produce investigative stories on issues with public interest and issues that are often excluded by the mainstream media. The project was designed with the purpose of experimenting as to how the concept of investigative journalism works in the context of video. SDJF with its partner organizations intended to learn from the process of making investigative video stories to determine opportunities and challenges. This study will not only concentrate on understanding the process and its effectiveness of investigative video story making program but also try to determine the possible threats and opportunities existing for investigative reporting in Sri Lanka. In order to explore the above objective, a case study method is used that includes a collection of tools, in-depth interviews with editors, sub-editors and academia, Focus Group Discussion (FGD) with regional journalists, partner consultations and reviews of existing literatures. This study is very much informed by Reporting for Change, Making Investigative Journalism a Reality in Sri Lanka (IWPR, 2017), Media Sustainability Index (IREX/SDJF, 2017), Rebuilding public Trust (NSMR, 2016) and Corruption Investigative Reporting (FMM). In addition to the strong literature review, 5 FGD, 20 in-depth interviews, and two consultations were conducted. It is also noteworthy that the Media Sustainability Index (2017) that includes in-depth dialogue with journalists, and a consultation with regional journalists were also conducted by the main author of this study. The study conducted by IWPR includes interviews with 75 journalists, 10 FGD and series of consultations with media associations. Investigative Journalism has been historically defined by various schools. Some tried to define it by differentiating it from conventional reporting. Some do it by making it unique in comparing with Watch-dog reporting. According to Marl Lee Hunter (2011) Investigative Journalism involves exposing to the public matters that are concealed – either deliberately by someone in a position of power, or accidentally, behind a chaotic mass of facts and circumstances that obscure understanding. When a journalist tries to report on matters which somebody wants to keep secret, this is investigative journalism. It reveals the hidden truth for the purpose of informing and exposing all necessary matters as required by the communities. Derek Forbes (2005) noted Investigative journalism does not only report something new – it educates, exposes and uncovers secrets. It requires using both secret and open sources and documents. Derek holds that investigative journalism involves in-depth reporting in the public interest, while others regard the concept of investigative journalism as a myth – an extension of what good journalism should really be. David Spark (2003) noted Investigative Journalism usually tackles unconventional subjects which may not always be covered in the mainstream news agenda. It appeals to the audience’s senses of what is just, and can look beyond what is conventionally seen as acceptable. Typical subjects include uncovering illegal practices, revealing abuses of power, questioning official assertions, and exposing miscarriages of justice or cover ups. It often takes a very long time to do an investigative piece. Coronel (2010) argues that investigative journalists need to look beyond individuals. According to her the best investigative work exposes not just individuals, but also systemic failures. Investigative reports show how individual wrongs are part of a larger pattern of negligence or abuse and the systems that make these possible. They examine what went wrong and show who suffered from the mistakes. They probe not just what is criminal or illegal, but also what may be legal and overboard but nonetheless harmful. There are several reasons why Investigative Reporting is extremely vital. People have a right to know about their society and decision on matters that is important to their life and to keep the people and organizations in governance accountable. Conventional news reporting depends largely and sometimes entirely on materials provided by others (such as police, governments, companies, etc.). However, IR is inherently expensive due to the need for extensive research, whereas ordinary news stories are fairly simple to obtain, IR may differ from other kinds of journalism because of the methods used. Mark Lee Hunter (2011) is of the view that conventional journalism is fundamentally reactive, if not passive. Investigative journalism, in contrast, depends on material gathered or generated through the reporter’s own initiative. IJNet refers David Kaplan (2013) who said Investigative Reporting is not getting a document leaked by a powerful official and writing it up that is not investigative reporting. Not all good reporting is investigative reporting. Investigations take time–weeks, months or even years. Investigative journalism may have critical elements, but just because you’re writing something that is tough and critical does not mean you’ve done the digging that investigative reporting involves. In-depth reporting of any social matters that affect the public interest. A long-term process of planning, information gathering and corroboration using a diverse range of sources. The application of more sophisticated techniques to interrogate and piece together meaning from fragments of information provided by various sources. Investigative reporting needs to be independent of special interests; it must aggressively serve the public trust and enrich public debate. Investigative reporting may have an agenda to expose any form of villainy or wrongdoing with the object of inspiring positive change through informed public debate and outrage (Derek Forbes, 2005). The ethnic conflict in Sri Lanka had systemic influence and effect in the entire media landscape. Both the conflicting parties used it to shape mass perspective in support of their position with regard to conflicts. In reinforcing such positioning, both the conflicting parties not only used media but also misused and silenced it as well. Journalists and media organizations with alternative political views were threatened, silenced, and killed during the war. People in conflict-affected areas are deprived from media and information. Natural fear lead to censorship within media. When it comes to safety of the journalists, during the war and aftermath, the rule of law is almost nonexistent. A large number of Sri Lankan journalists, IFJ estimated 40, fled the island fearing for their safety. The media that played significant role in setting up agenda for conflict, had to face different kinds of experience when it was globally urged for Sri Lankan government to ensure accountability and transitional justice. Most of the media organizations that had strong market presence embraced the nationalistic sentiments of political parties mobilizing support base. During the Rajapaksha regime, the overall media freedom was tremendously challenged. Media organization with alternative political view suffered immensely due to pressure created by Rajapaksha government. Many believed that the victory of Sirisena government created new opportunities for media freedom. As an election promise present government under his leadership re-launched investigation against murder and disappearance of former journalists. Arbitrary and illegal blocking of political websites are released (Internet Freedom). It also recognized access to information as a fundamental right through the 19th Amendment to the Constitution. Right to information was enacted. Media Researcher M.J.R David observes it as an historic movement of Sri Lankan Democracy that has created vast opportunities for the journalists to embark the culture of investigative journalism while advocating for public justice. Increasing number of journalists are using RTI through their media organizations, in association with their organizations and their personal capacity to carry out investigative stories mainly on issues that has a relevance for them. Director General of Government Information Ranga Kalansooriya mentioned that more RTI applications were filed by the journalists in the north. However, despite the action being taken by the government, media associations expressed displeasure on the outcomes and progress made so far. Lasantha Ruhunge, Chairman of the Sri Lanka Working Journalists Association indicated that launching investigation on the journalists who are killed is important. Still, what is more important is to offer the justice. Government need to prove its real intention by ensuring the justice. During FGDs, it was heavily noted that even the future reaction of present government in creating safe working environment for journalists would be highly unpredictable. There had been some incidents of journalists are being threatened, equipment’s are grabbed and beaten. When it comes to media reformation, The National Secretariat for Media Reform in Sri Lanka along with several other stakeholders has proposed to form a new independent entity – News Media Council and is working closely with various stakeholders to educate the public about the bill developed by independent consultants aiming at the formations of the council. Despite it is being widely criticized by some section of media industry, it is understandable that the revised draft of the bill concentrates on safety, media freedom, and editorial independence, while ensuring the quality and the journalism. This could be yet another opportunity to come in support of IR, in Sri Lanka. Looking at the current context, while investigative reporting is currently not a strong practice in Sri Lankan newsrooms. More than 65% believe that IR has made impact in their societies. FMM noted that the country’s journalists are willing to improve their skills and do more CIR work. 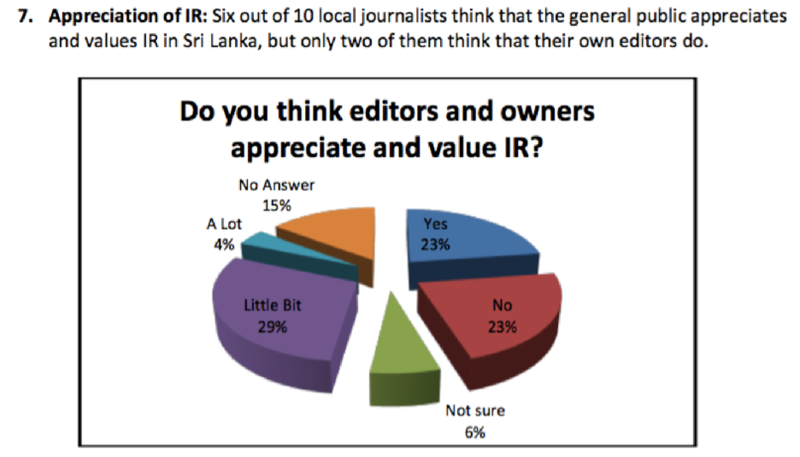 Both MSI (2017) and IWPR (2017) studies indicate that more than 75 percent of Sri Lankan journalists believe IR to be very important. Same amount of journalists believe IR has potential to help democratization in Sri Lanka. More than 70% of journalists believe IR has potential to change a social circumstance. When it was asked from journalists, 70% of them said IR has potential to change any given social circumstances. This makes a sense that potential of IR has been well understood by Sri Lankan Journalists. It was revealed by IWPR that IR is practiced better by any media that has multimedia environment where Print, TV, Radio and social media are combined. However, TV and Radio as separate media believed to be not effective for IR. During a consultation with editors it was noted that except in few occasions by very few, television and Radio are inactive as whole in IR. More than 70 percent of journalists agree the fact that traditional journalism in Sri Lanka is declining while social media is taking ground. At the same time, 70 per cent of journalists we interviewed think that social media is changing the way Sri Lankan people receive information. It was noted most of the journalists consider there are issues in which IR work better over the other issues. Amongst them are child and women issues, corruption, issue with public interest, cultural and racial issues, governance, development, politic, misappropriation of money, disappearance, health, and issues in relation with transitional justice. Journalist believe IR is weaker in discussing issues noted to be weaker corruption, ethical issues, politic, function of government entity (governance) and public contract and tenders. Some media continue to explore hidden truth around serious governance related issues. Central Bank Treasury Bond, Water pollution in Jaffna, Foreign trip of Ministers Using Public Funds are some of the issues explored by media with heavy interest. There are few local organizations with the support from International organizations have conducted series of trainings and capacity programs for journalists. Sri Lanka College of Journalism, Sri Lanka Media Training Institute, Sri Lankan Foundation, University of Colombo, University of Jayewardenepura, Media Resource Training Centre in Jaffna had conducted series of short courses that covered IR as subject. FMM and Transparency International Sri Lanka have conducted series of customized IR trainings for the journalists. FMM has trained hundreds of journalists on corruption investigative Reporting. Both FMM and Transparency International Sri Lanka had taken notable steps to train trainers, produce tri-lingual training module and to train journalists. Both Internews and IWPR has started working with journalist on data journalism and IR. IWPR is implementing a two-year dedicated program to enhance IR sector in Sri Lanka. Thomson Foundation and Konrad-Adenauer-Stiftung have conducted few trainings in Sri Lanka. Sri Lanka Development Journalist Forum (SDJF) has started investigative video storytelling program to support mid-career journalists with experience and interest to use video to produce investigative stories. However, despite notable contributions being offered, these local organizations did face few major common challenges; the programs are mostly donor driven – not certainly designed to support the broader development of the industry, IR has not been specific focus most the trainings being offered, there was no sense sustainability, and there is less of follow up and quality assurance. Rebuilding Public Trust (2016) noted that there are various courses for aspiring or entry-level journalists, but opportunities for mid-career or in-service training are more limited. The existing courses are not standardized or benchmarked. According to one media industry watcher, there is no training course that produces good news journalists with quality investigative and analytical skills. There is no dedicated IR courses or degree available in Sri Lankan universities. It was mentioned during the survey that no university in Sri Lanka has dedicated IR unit with extensive practical learnings. Most of the academic acknowledged that it has been little theory taught at universities and those theories may not be applicable to industry. NSMR (2016) observed that curricula of several universities are not updated to meet current need helping to enhance government transparency and accountability through investigative journalism. It also indicates evidence that some university academic believes IR is not high priority it is being taut amongst other topics. Studies conducted by various institutions reveals that IR in Sri Lanka facing various challenges despite the fact that it is slowly growing. Following are the few major challenges commonly identified by this study. Poor media pluralism: Poor media pluralism in Sri Lanka has been widely known factor that has caused most of the issues faced by the media. The research done by FMM, NSMR (2016), IWPR (2017), IREX (2017), and SDJF (2017) observed that media in Sri Lanka are owned by few segments of the society that are corporate either elite, religious leaders or political supporters. There is no transparency in the process of offering media license and allocating frequency for electronic media. NSMR (2016) given an extensive account on this issue. The poor media pluralism and legislation have implicit impact in the development of IR too. FMM noted that potential for investigative journalism is hampered by the political interests of press owners, fear of revenge, difficulty in collecting adequate information, and editors’ political interests. Sri Lankan media seem to bear a sense of responsibility for exposing corruption, but many are cynical about the mechanisms in place to prosecute and punish the corrupt. It was revealed by IREX and SDJF political affiliation of media ownership vastly affect the quality of IR. IWPR found out that they would have difficulty in placing good investigative stories even if they went to the trouble and risk of doing them – simply because of the political or business interests of the media owners. Lack of support from Editors – Most of the editors who were interviewed are of the view that that majority of the editors do not make free choice in publishing IR stories. Decisions of any serious IR stories sometime determined by the owners and editor on behalf of the owners. Therefore, editors are often support stories of political opponents of their owners. IWPR study hold that two out of 10 journalists think their investigative stories are not valued by the editors. They would be nervous of and unlikely to publish any investigative story offered without having the full confidence and support of the publishers and owners, they said. And this was not an easy thing to secure, especially for a provincial journalist or freelancer. MSI (2017) observed that editors become helpless in some case when the corporate companies offer them advertising. Some editors accepted that it’s the advertising section in their media institution that determine the nature of the first page of their newspaper. It is noteworthy that some regional journalist feel that their task is not to try producing IR stories but to be content and information providers of the mainstream media. Kajan a journalist from Mannar noted that regional journalists do not have role models to produce IR. Their Editors or News Directors are not concerned above capacitating us on IR, they get us to do what their owners want them to do. Kapila Ramanayake, a journalist from Matara indicated neither we have role nor do we have any resources for us to learn IR. It is just a myth that we the regional journalists are working in favor of IR. Skepticism: It was well realized during the study that there is a natural skepticism amongst the journalists and the civil society on how broader democratic values. Tilak Jayaratne & Sarath Kellapotha (NA) observed concepts like independence of the media and freedom of expression remained alien to the Sri Lankan society. For the most part, governments, politicians, the intelligentsia and civil society did not take steps to popularize these principles. When it comes to IR the fate is more or less the same. Many official information sources, including police and government sources, which suggests journalists are aware of corruption. However, when questioned more than 70% of the journalists believed to have not written any IR stories in the recent past. Similarly, the journalists that were surveyed by FMM reported that they had written few stories on corruption. It shows that 63 per cent had not produced a Corruption IR story in the previous month. It also appears that journalist and media organizations has subjective positions in choosing areas of investigation. Majority of the journalists surveyed accept the fact that they purposely refrain from choosing certain concern for IR. Lack of incentive: Majority of the journalists interviewed are of the view that they are not sufficiently paid. This situation is a very complex phenomenon and varies in different media. However, it could be concluded that except very few senior staff most of the journalist do field work, and not adequately paid. More than 70% of the journalist are not happy about their job security. Most of the available studies noted that majority of regional journalist would not want to do the IR, primarily because it will not be considered by the editors, there is no guarantee that it will be compensated. It was observed that most of the regional journalist are paid one or two US$ for their stories. However, regional journalists are of the view that this money is not at all sufficient. However, it was noted that some TV channels do pay nearly averagely $20 per stories. Hence, IR faces strong threat due the condition explored above. Alex Kamilesh, a journalist from Jaffna observed that we spent several hours on a news. We are only paid LKR 2000. There is no guarantee that the news that cover would be taken by the editor. A journalist from north observed No machine waste, no transportation cost reimbursed. For fax we need daily 200, mobile we need 200 per day, for daily transport we need 500, we used to travel 50- 90 km sometime. Sometimes, they will get only one news even if I send five. This is the situation for regional journalists. Political affiliation: It was noted that media time to time changes their political affiliations. At the same time the linguistic and regional affiliation of the media organization to the development of the IR. Good example that recent constitutional reforms process was reported very positively as a ‘new opening’ for Sri Lanka in Tamil newspapers, yet reported negatively in the Sinhalese press where it was presented as being promoted by the international community as part of a ‘plan’ to divide the country. This shows clear divisions between journalists based on their linguistic and regional affiliation. Verity Research has continuously revealed on this. Safety: Most of the editors and journalists interviewed of the view that despite the fact present government not severely monitoring and directly threatening journalists they use indirect means to create fear amongst journalists. Study conducted by IWPR (2017) noted that despite the change in government and more favorable operational climate, safety and security remains a serious concern. Journalist interviewed reveal that safety of the journalists are not part of organization culture in most of the media organizations. More than 85% of the journalist said they do not have a life insurance. MSI conducted by SDJF and IREX noted that Journalist from Jaffna believe impunity has continued to be a concern. Chief Editor of Uthayan Prame Ananth noted that he has been asked to summon by court to reveal the source. Kamilesh – Still we have CID follow our journalists in the north. A journalist working for private TV station in Vavuniya observed that media organizations are not fully committed for the safety of the journalist. He mentioned “I was beaten by some people in Vavuniya assuming I am a strange film maker and not a journalist as I didn’t have media identity card. When this happened, my media aired several news on this. I had to go in front of court around 13 times. They paid only for three times. Rest I paid on my own. Later it became my own issues. When journalists are threatened, media organizations tends to make it sensationalized rather than try to provide solution to the problem.” Isbahan a print journalist working in Colombo told that “If I want to report a news, I should take responsibility of my own safety. No media would be willing to consider the safety of regional journalists. Most of the media do not have a safety policy for journalist. In case if we end up with any issues they will tell us why did you go for converge. It was also observing some media organization do not provide media accreditation card in recognition of regional journalist working for them. Some journalist from the north and east said they are managing with the Logo of the TV station and some said they managing with Branded T-Shirt it has some indication that they are journalist. A journalist working for a private TV station indicated that some media organization do delay the provision of media ID for various purposes. Lack of future orientation: Several studies found most of the mainstream media organization are yet to understand the impact of the convergent media and how it has changed the way that people receive news and information. Except very few, most of the regional media organizations do not use social media tools for wider reach. Digital tools are available for IR. IWPR study noted that there is Pro-print lobby that is skeptics on convergent media: Traditional media outlets in Sri Lanka will face an existential threat as the prevalence of smart phones and social media usage continues to increase and consumption habits change dramatically. Thus, for IR to develop and sustain itself in Sri Lanka, innovation and creativity will be required across the board. A holistic approach is also critical. Problems in Training: When it comes to training journalist on IR, there is a serious problem on the quality of IR courses and training programs and how the journalists are being selected for the trainings. Sometime, much of these courses and trainings would end without any or proper practical experience. IWPR (2017), SDJF (2017), IREX (2017), NSMR (2016) acknowledged that lack of practical exposure and poor selection of the journalists required benefits are not attained. Tilak Jayaratne & Sarath Kellapotha observed internal favoritism and political affiliations have let wrong people to attend the trainings programs. At the same time, most of the trainings are being conducted to meet short-time project objectives of implementing organization and not necessarily to meet the demands. When International Media Development and Donor Organizations want to engage local media organization and training institute to conduct IR training – they usually don’t invite journalist in the periphery. The key loyalists and members of those media association get most of the training opportunities. Trainings are given mostly for editorial staff. But they are the ones who do not do reporting. It’s us who are doing reporting. Issues are not only in Colombo. Most of the issues are existing in villages. Investigative Video Storytelling Program – #IVS, initiated by Sri Lanka Development Journalist Forum (SDJF) in partnership PGIA and supported by IWPR to capacitate 25 young mid-career journalists who are interested in using video as potential tool to produce investigative stories on issues with public interest and issues that are often excluded by the mainstream media. The project was designed with the purpose of experimenting concept of investigative journalism in the context of video. SDJF with its partner organizations intended to learn from the process as to determine opportunities and challenges in producing investigative video stories particularly with community participation. SDJF called application through social media, partner organizations and likeminded networks to mitigate cost usually spent for traditional advertising. Out of 25 participants, 50% are TV journalists working for mainstream media and news websites – all of them are boys. 40% of the participants are girls – studying media or use video in their regular work. Rest of the 10% were youth passionate about using video story, in their works. Eventually, 10 days of residential workshop on investigative video storytelling was conducted by SDJF and PGIA. Training was designed in a manner that four different aspects – learning theoretical aspect of IR, learning video storytelling relating with aspects of IR and data journalism, planning a story, and filming and editing. As a result of the training, participants ended up preparing 10 story outlines. It was anticipated that the video makers should involve respective communities – a community storyboard nearly with 10 members from the community, in a manner that is not hampering the video production process, to validate the story hypothesis developed for each story outline validated. This community story board is expected to help identify issues, validate the hypothesis, involve in story planning, facilitate filming and dissemination. Towards the end of the project, both SDJF and IWPR planned to host an investigative video summit and to invite immediate respondents – government and private authorities for a solution oriented discussion. At the time of writing this study, the half of the stories are filmed and rest of the activities project yet to finish. Therefore, this study would cover on the activities that has been implemented so far. During the training period, young mid-career journalists concluded a working definition for investigative video story. Accordingly, investigative video story is visualization of an in-depth and objective inquiry of a journalist on a hidden truth or reality that is a matter in public life. The process of the story making is equally important as the purpose of the story. It is a creative and sensitive process to engage supporting institutions and individual to explore a hypothesis. The hidden truth could be on corruption, wrongdoing, power abuse of government, procurement fraud, unauthorized public business, land grabbing, systemic abuses etc. The midcareer journalists noted that video may not be used throughout the process in filming entire stories. However, it was said video is extremely powerful when using it interviews, evidence, testimonials, visualization of effect of a hidden truth and archival documents. It is extremely an effective tool for data visualized and idea presentation. Video allows to bring people reaction and emotions into the story. It allows to show rather than telling a story. People regarding their literacy level can see what is happening around a story. A powerful story can be told in very few minutes. It allows the journalist or the news media organizations to creative advocacy too. The initial evaluation of the training indicated young 95% of the journalists have never worked on an investigative story. Almost none of them has been requested to produce any IR stories in their regular reporting affairs. Some journalists noted that they have enormous stories to be filmed in their own settings and however, they are not sure those stories will be of interest of editors and owners. When inquired, 8% of the journalists noted sourcing story is not a thoughtful effort in their reporting. Most of the midcareer journalists noted their reporting involve; covering an incident – any political events where a politician would speak is the first priority, taking the voice cuts of government officials and particularly ministers, and victims who may speak in favors of the story considered to be the best way to source stories. Katheesan, a journalist from Vavuniya observed that media organizations in Colombo is really keen to do speedy report and sometime, we cover three stories per day. Some time we get footage from fellow reporters as we cannot certainly cover two to three news per day. A TV journalist reporting to a private TV said his station encourages to take highly sensationalized short from incidences such as accidents, communal fights, death, gun fights etc., When we say there is an accident the next questions from the editors would be how many died. However, the mid-career journalists agreed that investigative video story cannot be made this way. Mohammed Fazlan, a Television Reporter said I used videos to capture incidents. In future I will use the same camera to capture stories. V. Kajan, Journalist, Mannar – For the last four years we have only been doing ordinary reporting of various events taking place in our district. We are always instructed to look for elements that make our news sensationalized. We thought that is what a journalist can cover to the maximum. After attending this workshop, I came to know, task of a video journalist is not just dictate what happened, but a narrating a story. Mohammed Rijaz, online journalist said that for the first time I understand investigative reporting is much unique from conventional reporting and realized that investigative reporting is a big responsibility, and deep commitment. Kamilash, a journalist from Jaffna noted that what is more important in producing video story is to build trust in target community. We need cyber security and technology related knowledge with practice on GPS, digital recording equipment, follow-up footage collection, how to use hidden camera without breaking ethics. “I need more mentorship. There should also be link between editorial and regional reporting, not annual meetings.” Majority of the participants noted that the way that they were asked to be filmed – they sometime missed the stories ended up filming some aspect of it. The civil society activists noted that they are confident that video can be used to expose hidden realities of the communities they are working. Sujeewa Egodarachchi, Women’s Right Activist holds that we have strongly engaged in media but never used video. Video sounds an interesting and effective way of collecting and compiling evidence, sources, etc. Niranjala Gunawardne, Women’s and Child Right Activist – I learnt not only videography, but how to use video in the context of investigative journalism. I can realize my own insights towards community issues and I wish to address them using investigative reporting. I understand that investigative reporting needs a scientific process and wisdom. Throughout a participatory learning process, participants ended up designing below methodology allowing journalists to film their stories. This methodology was pre-tested through sample stories that are made during the training period. Formulate a community editorial board: Community Editorial board could comprise with cross section of people in the concerned community – 10 people in a community is maximum. It was observed, they may access the data quickly then the journalists. They would know the story angle equality as the journalists. They used to also suggest convenient way to access not only data but the people. They may or may not be sensitive to the process. However, it was noted that they need some form of engagements to abide by ground rules and working norms. A sensitization exercise very much needed for this methodology. Identify and validate issue and story: It was noted that most of the journalists assumed issues and story are same. Story identification exercise allowed them to differentiate issue and stories. One issue may have several story aspects. One issue may have several filming viewpoints. The #IVS allowed participants to validate their issues by engaging the target community. For this, various creative methods are used with the view of sensitizing the community story board members. engaging community board is partly to empowering them and partly also informing the production with their local knowledge and perspectives. This is in some case helped the participants to re-visit the issues they have selected. Formulate a hypothesis: In this phase, hypothesis will be formed. However, mid-career journalists with little or no knowledge of research experience had some uneasiness. In that context – participants defined a formula to form strong hypotheses – Simple, specific and Short (Three S’s). Ask as many questions as can to determine that the hypothesis meet 3S criteria. Developing a support base: Since #IVS concentrated on addressed issues that has community interest, it was determined that identifying supporting organizations and individuals – to validate issues, help collect and validate data, to help facilitate the filming, to help with logistical requirements etc. It was experienced that connecting organizations and individual from concerned communities makes the investigative process very easier. Collects and validate data: This is the most time taking step. Community Editorial Board members can also use in this process. This need regular reflection, examination of the types of data available. It is very important to make sure the data being collected informs the hypothesis. Various techniques can be used to engage both the parties to determined the reliability of the data being collected. Film the story: This involved filming entire elements necessary for an investigative story. It was observed filming is the most hassles taking step. Having adequate time and passion and patience is very important for filming. Validate and publish: Even after the filming is done, it is useful to get the story validated by the Community Editorial Board. By now, people in the community would have good amount of knowledge on a hidden reality. Visual Fear: It was noted even responsible authorities, and concerned parties refuse the support at last movement just for being fearful for video. So, whether a sophisticated filming process is required is contextual. Time taking: Every aspect of the filming would take time. Every story that may not have value to conduct an investigation may not go through this process. This is a time taking process. Community Editorial Board: Community Editorial Board can be extremely helpful and equally problematic as well. It was learned that working with immediate concerned parties will keep the support base alive and safer. Communication issues: This process need physical intersection mostly. When dealing with people over the email, phone – everything may sound easy and convenient. But in the field filming crew will have to face practical challenges. Field work structure: Field works should be planned well in advanced in a manner each activity is being build with other connected activity. Random planning may cost a lot. Process may change all the time: There is no quarantine that the film crew will end up validating desired hypothesis. News issues, news stories, new people, new finding can appear at any time. Physical safety: This is very important aspect video team would always work with equipment’s too. Sensitivity concerns: producing video is extra sensitive. Film crew should have strong sensitivity check list to filter potential issues. At the time of writing this study, video has enormous potential for to develop social capital, establish community based support groups, mobilize target community with passion to explore the hidden truth, make data visualization, dissemination, create effective testimonials, etc. However, it is understood that the potential of the video story should be further discussed supporting evidences in completion of this project. A structural transformation in the aspect of editorial independence is required to develop true IR culture in Sri Lanka. It was observed poor media pluralism, political affiliations and commercial dependency of ownership compromises the quality of IR in Sri Lanka and it needs a structural intervention. However, issues related to quality, awareness, capacity building etc., needs a strategic approach for development. A corporative organization with dedicated mandate and an integrated approach to enhance IR sector may address these issues. Isolated trainings and workshop may not be solutions for any of the issue discussed above. The second possibility to is to invest on convergent media, support emerging web-bases independent media workers. Trainings and capacity buildings offered to journalist who are not dependent on traditional media could enhance the sector. Supporting journalist who work for independent web-casting sites, news websites, blogs, social media with proven skills can be supported. Looking Investigative Video Storytelling program being discussed in the papers, video could be considered as highly potential media for IR. However, it is realized that more action-oriented studies needed to make strong determinations as to how video could effectively work particularly with mid-career journalists and communities. International Press Freedom and Freedom of Expression Mission to Sri Lanka. (2008). Media under fire: Press freedom lockdown in Sri Lanka. International Federation of Journalists (2015) Country Report: “Media and Gender in Sri Lanka” Part of the IFJ Media and Gender in Asia-Pacific Research Project: IFJ. Coronel, S. S. 2010. ‘Corruption and the Watchdog Role of the News Media’. In: NORRIS, P. Public Sentinel: News Media and Governance Reform. Washington DC: World Bank. Derek Forbes, 2005. Watchdog’s Guide to Investigative Reporting, Konrad Adenauer Stiftung, Johannesburg. Free Media Movements, Words to Action, Investigative Reporting on Corruption, Colombo. International Federation of Journalists, 2015. Country Report: “Media and Gender in Sri Lanka” Part of the IFJ Media and Gender in Asia-Pacific Research Project: IFJ. IREX/SDJF, 2017. Media Sustainability Index, International Research Exchange Board, Washington DC. IREX/SDJF, 2017. Viability and Strength – consultation Report (unpublished). IWPR, 2017. Retorting for Change, making Investigative Journalism a Reality in Sri Lanka. Mark Lee Hunter, 2011, Story Based Inquiry, A Manual for Investigative Journalist, UNESCO, Paris. National Secretariat for Media Reform in Sri Lanka, 2016. Rebuilding Public Trust, Colombo. Spark, David, 2003, 5. Investigative Reporting, A study in technique: Focal Press, Story-Based Inquiry: A manual for investigative journalists. Swaminathan Natarajan, 2012. Media Freedom in post war Sri Lanka and its impact on the reconciliation. Tilak Jayaratne & Sarath Kellapotha (NA)The Political Economy of the Electronic media in Sri Lanka.